A Walking School Bus is a group of students, led by an adult, who walk to school together. A Walking School Bus is a group of students accompanied by at least one parent. 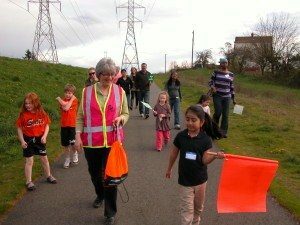 A Walking School Bus is an active community-building tool that shows students the social, emotional, and physical benefits of walking. A Walking School Bus helps parents feel good about allowing their children to walk to school while minimizing their time investment in school drop-offs/pick-ups. Recent street work has been done to put in sidewalks from the Greenway on 39th Ave NE, to go eastward across 40th Ave NE to reach View Ridge and Thornton Creek Schools. This work is part of creating greater safety in walking and biking to school. Wedgwood School also has new sidewalk projects going on, which eventually will connect with Ravenna Avenue NE along NE 83rd Street.